HANOI -- The 3.6 hectares in southern Vietnam that double as rice paddy and shrimp pond for farmer Nguyen Thi Tam have become a wasteland. After the worst drought in 90 years, almost nothing grows. Mrs Tam's family had no income for two harvests because the rice crop failed and the shrimp died. They ran up US$8,000 in debt -- more than twice her earnings in a typical year. To make ends meet, Mrs Tam plans to leave her village to work at a factory hundreds of kilometres away. Many others in the area already have fled, she said, including her daughter-in-law, who couldn't endure the poverty. "I am worried about everything," Mrs Tam, 55, said inside the thatched house in Kien Giang province she shares with her husband, three grown children and two grandchildren. "I cannot sleep." 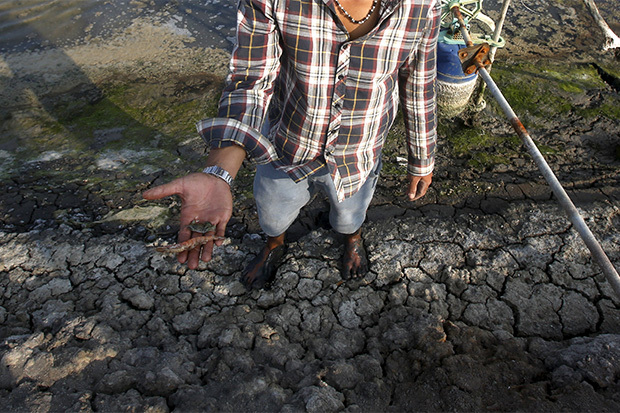 The dry spell in the once-fertile Mekong Delta is devastating food supplies in southern Vietnam and threatening to reduce global exports of rice, seafood and coffee. 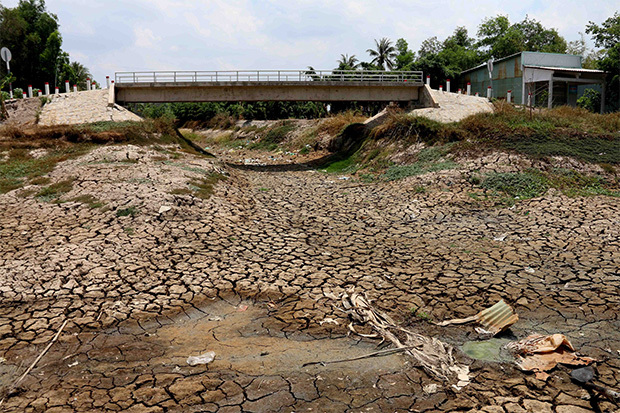 It is also compounding a Southeast Asia water shortage along a 4,800-kilometre river that runs from Tibet to Thailand to the South China Sea, as climate change and too many dams erode livelihoods for millions of farmers. Waters in the Mekong Delta, a network of channels that cut across vast flatlands in southern Vietnam, are at the lowest in almost a century, which may mean shortages for as much as 50% of the region this year, according to a United Nations report. That means less for irrigating crops and an increase in salt levels as more seawater seeps into the delta, causing more damage. The Mekong River countries of Vietnam, Thailand, Laos, Cambodia and Myanmar produce about 62 million tonnes of rice, or 13% of global output, US Department of Agriculture data show. The river accounts for as much as 25% of the global freshwater catch and provides livelihoods for at least 60 million people, according to the World Wildlife Fund. Vietnam exported about $3 billion of shrimp last year. Almost half of Vietnam's population of 91 million works in agriculture, which accounts for about 13% of the economy. "People in Indonesia and the Philippines will go hungry if the Thais and Vietnamese don't produce enough rice," said Richard Cronin, director of the Southeast Asia Program at the Stimson Center in Washington. "This is a preview of the longer-term effect of development and climate change to the Mekong Delta." Rice exports from Vietnam, the world's third-largest shipper, probably will drop 10% this year because of lower production, said Do Ha Nam, the chief executive officer of Intimex Group, a major Vietnam exporter of agricultural products. Rice output from the Mekong Delta fell 6.2% in the first quarter from a year earlier, reducing the country's total agricultural production by 2.7%, according to Nguyen Bich Lam, head of the General Statistics Office. Water from the Mekong was already under pressure before the drought, which the UN attributed to a stronger-than-normal El Nino weather pattern. China has completed six of seven major dams on the river in southern Yunnan province, Mr Cronin said. Vietnam has built dozens in the Central Highlands, which, like the Chinese and Laotian dams, deprive the Delta region of the critical sediments needed to replenish eroded soil, he said. Eleven more dams planned in Thailand, Laos and Cambodia could result in fish and farming losses of $750 million in Vietnam and $450 million in Cambodia, with extinctions for as much as 10% of fish species in the region, according a study submitted to the Mekong River Commission, a group created to mediate water disputes.